Selhurst Park was built in the early 1920s after Crystal Palace had bought a piece of land from the Brighton Railway Company and architect Archibald Leitch had been hired to design the new stadium. 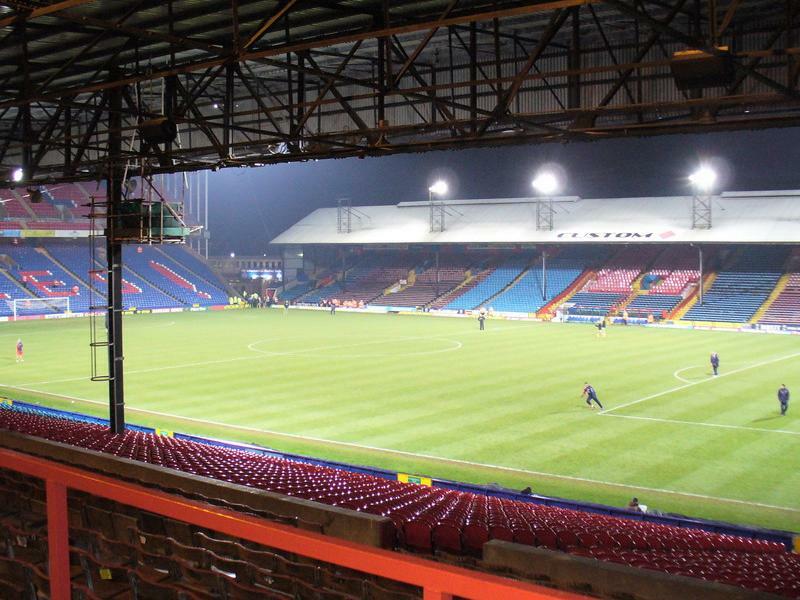 Selhurst Park officially opened on 30 August 1924 with a match between Crystal Palace and Sheffield Wednesday. It consisted of one covered main stand and large terraces on earth banking on the other sides, though the main stand had not been completed in time for the opening. Few changes were made to the ground until in 1969 the Arthur Wait Stand got built opposite the main stand. Selhurst Park set its record attendance in 1979 when 51,801 came to see Crystal Palace beat Burnley and win the Second Division. In 1983, the club sold the back of the Whitehorse Lane terrace to retailer Sainsbury’s in order to raise money to pay off their debts. A few years later, the remainder of the stand got fitted with executive boxes and a roof. Much of the stadium had then already been converted into an all-seater. 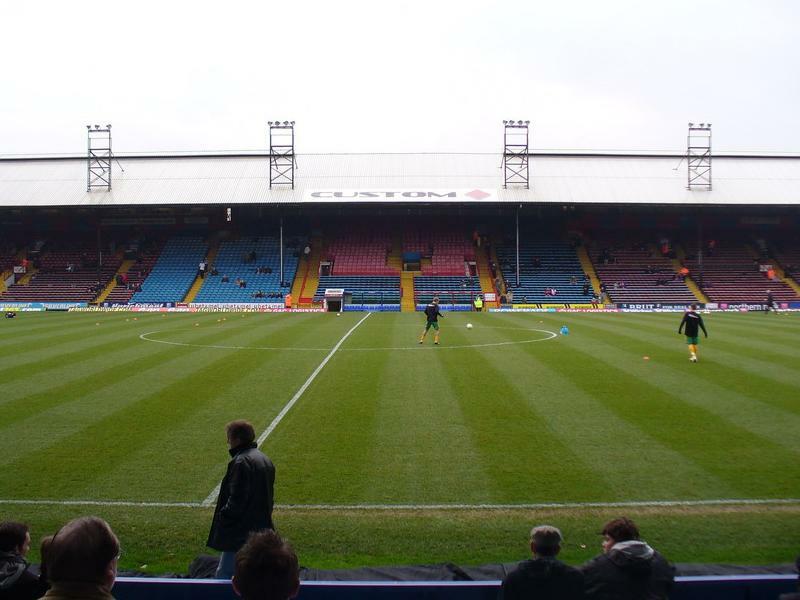 In the late 1980s, Charlton Athletic moved into Selhurst Park after they went into administration and temporarily lost their home ground, the Valley. Later on, Wimbledon would also use the ground after Plough Lane had fallen into disrepair. 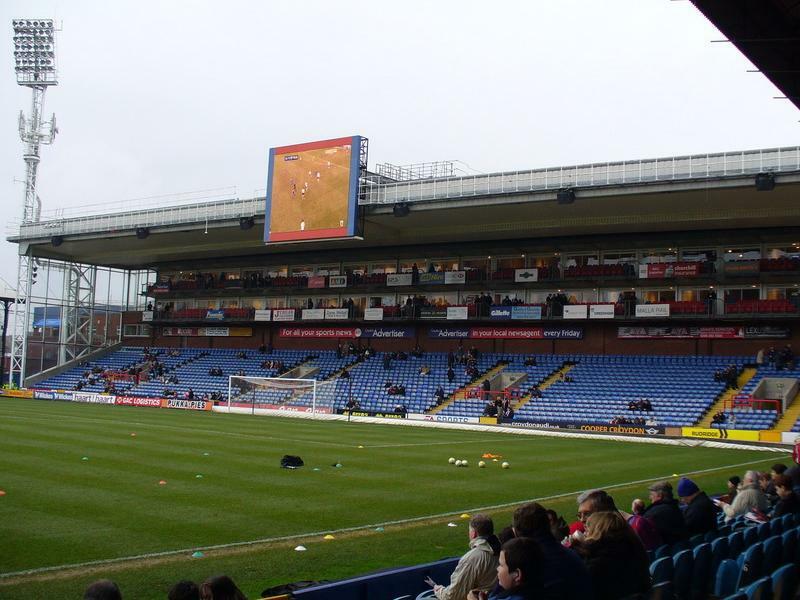 Selhurst Park underwent its final developments in 1994 when the Homesdale terrace got demolished and replaced by a two-tiered all-seater stands. At the same time, a new roof got installed on the Main Stand. 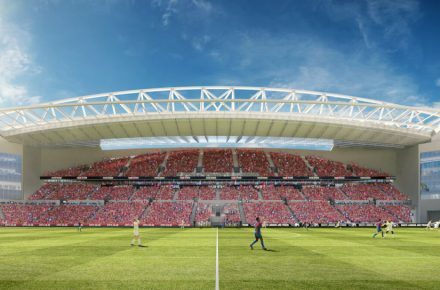 In 2017, Crystal Palace revealed plans to build a new Main Stand. The new stand will be able to hold 13,500 spectators, raising capacity to 34,000 seats, and come at an estimated cost of £100 mln. 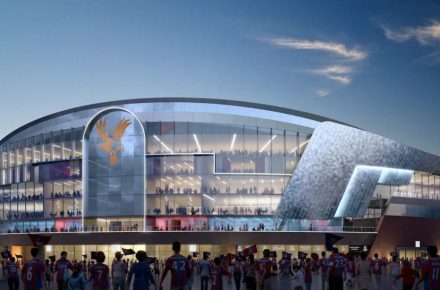 Palace hope to start construction of the new stand in 2018 and will be able to keep playing at Selhurst Park during its construction, which is expected to take up to three years. 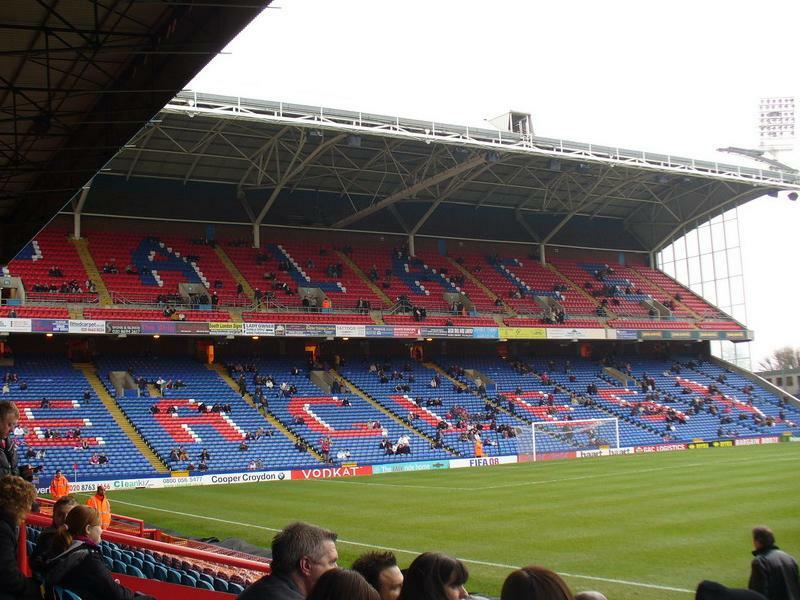 Selhurst Park is located in the far south of London at about 8 kilometres from central London. The stadium is best reached by train. Both Selhurst and Thornton Heath station are a 5 to 10-minute walk away from the ground. The stations are served by trains coming from Victoria and London Bridge stations in the centre. The journey takes 25 to 30 minutes. Trains also call at Clapham Junction. Norwood Junction station lies at the other side of Selhurst Park at a similar distance. It has service from London Bridge station, and arrives quicker than the above trains (in 10 to 15 minutes). There are furthermore a few buses that connect with the stadium. Bus 468 can be caught from Elephant & Castle, and bus X68 can be taken from Russel Square in The City or Waterloo Station. Both buses pass the stadium on Whitehorse Lane. Selhurst Park is located in a quiet residential neighbourhood. There are a few pubs and typical fast food outlets in the vicinity of the stadium – mostly so on the High Street near Thornton Heath station -, but the options are rather limited. There are no hotels directly near Selhurst Park, and even the offer of rental apartments is limited. The closest hotels are in the Croydon area, just south of the stadium one train station or a half an hour walk away, but if you expect to spend more time in London, you will likely prefer a hotel somewhat more central and make your way to the stadium by public transport. Ticket for Crystal Palace games can be bought online, or at the Ticket Office at Selhurst Park. Home matches fall into two pricing categories. Tickets for category B matches, the cheapest, range in price from £27.00 for a lower-tier seat behind the goal to £38.00 for a seat at the main stand. Ticket prices for category A matches, the most expensive, range between £37.00 and £48.00. Crystal Palace currently only sell tickets to club members so you need to buy a membership first before you can buy any match tickets. The cheapest membership costs £25.00. If buying a ticket for a top match, Palace will require you to also buy a ticket for a Cat. B match. 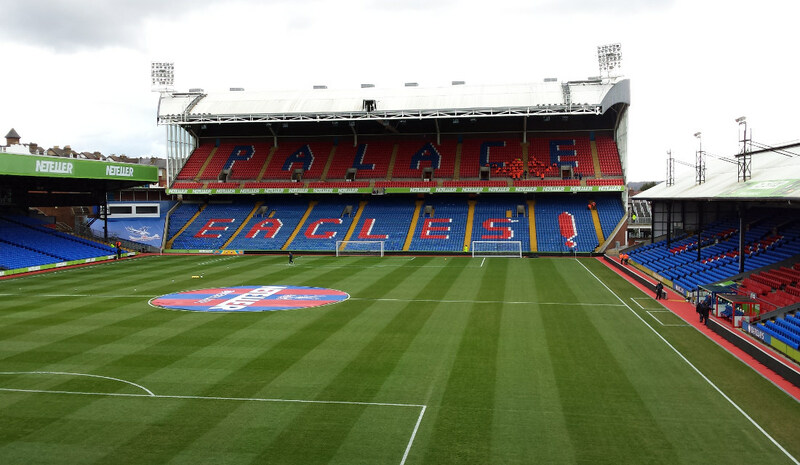 For more information call +44 (0) 8712 00 00 71 or email boxoffice@cpfc.co.uk. Cpfc.co.uk – Official website of Crystal Palace FC. Visitlondon.com – Official London city guide. Tfl.gov.uk – Website of the London Underground and other London public transport. Journeyplanner.org – London public transport journey planner. Nationalrail.co.uk – Check train times and fares. The atmosphere is like nothing I ever experienced in going to sports events. The staff is outstanding and helpful.